Have you ever gathered wild strawberries? Every spring we picked tiny but incredibly sweet and flavorful berries from the ditches of the tar-covered road in front of my childhood home. There are no thorns or stickers like some berries, but there is something much worse in my book. POISON IVY! Unfortunately, those “leaves of three” scattered throughout the wild strawberries held an unpleasant surprise. Within a day, I would start to itch….and scratch…and itch some more. For your sake, I hope you can not relate to this story. I’m starting to itch just thinking about it so let’s get on with the good stuff. The inspiration for these muffins come from the strawberry balsamic muffins I used to buy from the Central Market Bakery in Ft. Worth. Please understand I’m not claiming to have the authentic recipe. After much experimentation, this muffin seems to be a good clone. No matter, it is delicious on its own merits. 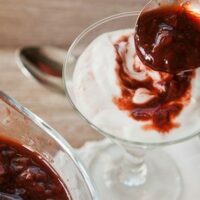 A few weeks ago, I shared my super quick and easy method for making a strawberry-balsamic sauce using frozen strawberries. It has two ingredients and cooks in only 6 minutes. 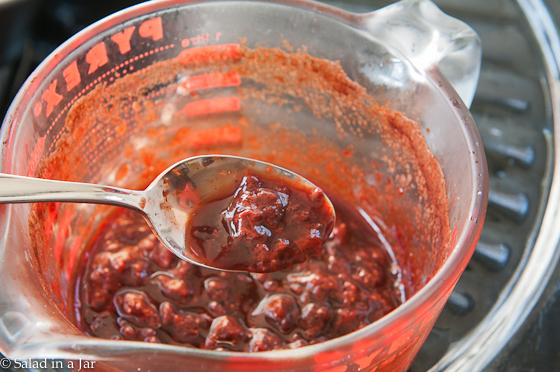 The result is something similar to strawberry preserves but not as thick or sugary. 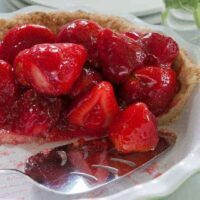 Because the strawberries are cooked, you won’t get soggy spots inside your baked muffins like sometimes happens with fresh strawberries. 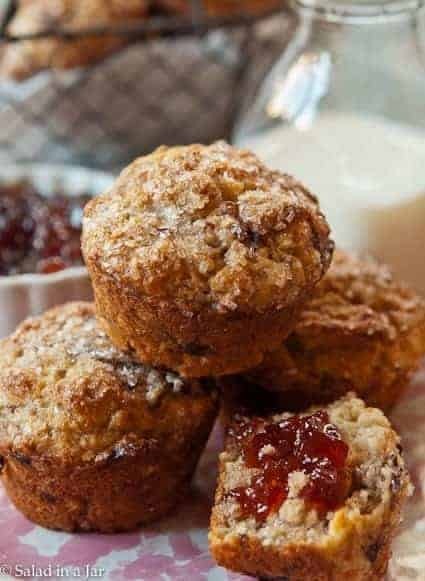 Goat-cheese crumbles give these muffins a distinctive flavor. The recipe shows a range of amounts so you can customize according to your love for goat cheese. You could also leave it out the cheese or use toasted pecans instead. The results will be equally scrumptious. If you try these muffins, please come back and leave a star rating (shown inside the recipe.) No comment is required, although comments are always appreciated. Melt butter in microwave for one minute on HIGH. Allow to cool. 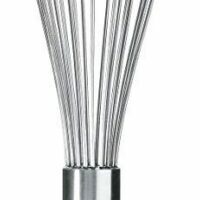 Whisk flour, sugar, baking powder, and soda in a medium mixing bowl. 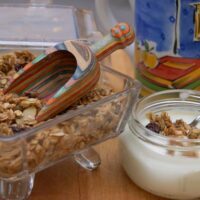 Combine yogurt, egg, and melted butter in separate bowl. Add to dry ingredients and stir just until moistened. Do not overmix. Lightly fold in strawberry-balsamic sauce and goat cheese. Portion evenly into muffin pan that has been greased and floured. 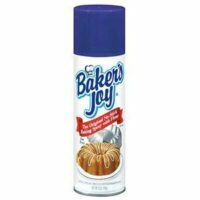 (I use an aerosol flour/butter mixture.) 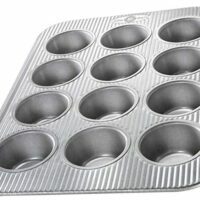 Muffin pans vary, but I usually end up with 9 smallish muffins. 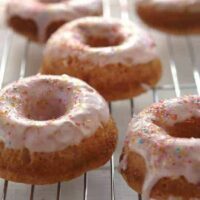 Sprinkle liberally with sanding sugar. Bake for 20 minutes. Allow to stand for 5 minutes before removing from pan. Chop 1-1/2 cups frozen strawberries. Place in a Pyrex dish no smaller than 1 quart. Add 1/4 cup balsamic vinegar. Cook in microwave, UNCOVERED, for 6 minutes, no stirring required. 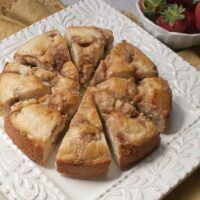 Kid-Friendly Coffee Cake uses Bisquick base with no nuts or unusual spices. Can be prepared the night before and cooked in the morning if desired. I just made these muffins. The only changes I made were using 2 T of honey in the sauce (Heavenly) and using the goat cheese crumbles over the top before baking, instead of inside the muffins. Oh, and I added a tsp of vanilla to the recipe. I wish you could see them! They are very good and I thank you for the recipe. The batter WAS stiff, but it stayed moist in baking. Glad you liked them. Love the idea of putting the goat cheese on top. Sounds very pretty. I will try the honey too. Thanks for writing. 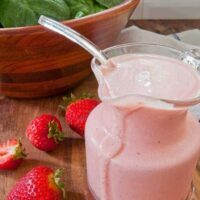 I was just looking for a good recipe to use up some extra stuff in my fridge (yogurt and strawberries) and this turned out to be perfect! I didnt add the cheese simply due to lack of it, however, I bet it would be delicious! I also had to add some milk because my batter was a little more like stiff dough without it. Nonetheless, great, easy recipe! Thank you. Glad you liked them, Ivy. what a fabulous idea for muffins! I would never think to make something savory like this but I can imagine how good it tastes! I discovered your blog a few weeks ago when your “salad in a jar” video made its way to my Pinterest page. I have since done that and found it to be THE KEY to eating salads. When the lettuce is “at the ready,” there is no excuse to not have a salad. Thanks for sharing that great tip. Anyhow, these muffins sound delicious. 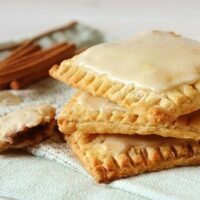 I’ve pinned the recipe to my page. 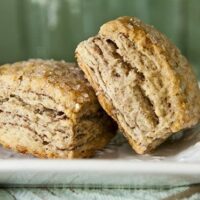 A muffin with a piping hot cup of Earl Grey would be a delightful morning treat. okay, I made them. I used regular yogurt and I also put them in cupcake papers. They didn’t come out neatly- but maybe that was the yogurt substitution OR the reason Paula used greased muffin pan. They were YUMO. I went with maximum amount of goat cheese. You don’t have to be a goat cheese lover to adore these! I actually cored the middle and made a filling of strawberry jam, the leftover balsamic mixture and cream cheese (light). Delicious! I like the way you bake. 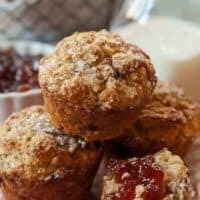 Adding jam and cream cheese to the middle would absolutely put these muffins over the top! Can I use another yogurt if I do not have the greek? Yum sound delicious, Paula what if your not huge fan of goat cheese what could you use instead? maybe cream cheese? I’m not a fan of goat cheese but if the flavour was not overwhelming in these muffins I’d be willing to give them a go. They look delicious Paula. A great trinity of flavors, for sure. And “spring” strawberries are beginning to show up in supermarkets now. Great, great, great!! These muffins must be terrific. We love the combination of goat cheese and sweet ingredients. hummmm, Don’t think I have ever tasted goat cheese. These muffins look great and I really need to do something different for my valentine besides chocolate. This may be just the recipe for the special ones in my life. I just might take these on. Happy Valentine’s and again as always thanks for the motivation of trying something new and exciting.